Do you ever wake up feeling stiff and achy, as if your body is being weighed down by a pile of bricks? Everyone wakes up feeling like this from time to time – you might have had a tough workout the day before, you might have spent an excessive amount of time on your feet running errands, or you might even be coming down with a cold. These are all common reasons why people might wake up feeling achy. However, if you find that it becomes a frequent occurrence, and there doesn’t seem to be any rhyme or reason for your pain or stiffness, you may want to contact a physical therapist. Stiff and achy joints may certainly be the product of a minor issue that can be easily remedied. In other cases, it could be due to a larger, underlying issue that a doctor may have to diagnose. Whatever the case may be, physical therapy can help. Give Applied Physical Medicine a call today to see how we can relieve your aches and pains! Why do I ache in the mornings? Sometimes your joint tissues can become irritated from overuse throughout the day, without you even realizing. When you fall asleep, you are almost completely immobile for several hours, which can cause inflammation of the tissues to grow thicker and further irritate the affected area. As a result, you wake up in the morning feeling stiff and achy. In most cases, this feeling will begin to ease quickly, after you get up and walk around. This is because movement causes the inflammation to become liquid-like, allowing pain to lessen. A simple remedy to avoiding achy morning wake-up calls is hydration. Staying hydrated allows your body’s tissues to function at their normal pace, whereas dehydration slows down your chemical processes. This will keep your tissues from becoming overly inflamed, easing irritation. What if it’s more serious? All of these conditions can cause aches, pains, and stiffness. Physical therapy treatment plans for these conditions will focus on helping you achieve a greater range of motion in your affected joints or limbs, in addition to providing pain relief. These work to improve overall function and help you get back to your normal mobility. Sleep it off. Getting a good night’s sleep creates an endless cycle of benefits, especially when it comes to physical therapy. Sufficient amounts of sleep will increase your ability to exercise effectively, which in turn will help you sleep better at night. Your sleep and exercise habits go hand-in-hand, and the results of one will always affect the other. Eat right. Consumption of brightly colored fruits and vegetables can help alleviate pain. These healthy foods have more antioxidants and vitamins, which fight off the inflammation that leads to pain and irritation. A better diet also helps you to get better sleep and helps your body receive more benefit from exercise – thus, adding to the endless cycle of benefits. Stand up straighter. Proper posture is a great way to avoid unnecessary aches and pains. If your work requires you to sit at a desk for long hours, or if you stay sedentary for long periods of time every day, try to get up every half hour for some light stretches. Relieve joint pain by moving around and keeping your circulation going. Try to avoid slouching or hunching at your desk, making sure that your spine is straight and your shoulders are back. You don’t have to be an athlete to work with a physical therapist. In fact, you don’t even have to be in shape to work with a physical therapist. 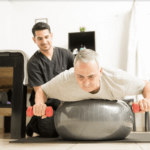 Many people avoid physical therapy due to embarrassment, but your physical therapist will help you create a treatment plan for your specific needs, and he or she will never judge you. Rather, he or she will encourage and support all the achievements you make along the way! Most of the exercises and stretches that your therapist will recommend are simple to perform and don’t require any special equipment — and most of our patients are just regular people (not super athletes.) We would love to help you along your journey toward long-lasting pain relief. Call our Tucson, AZ office to schedule a consultation today, and we’ll help you solve your aches and pains once and for all!